At Gunblast.com, we are constantly receiving products for review, some of which are junk, while others prove to be quite useful. Some are good products that simply do not mesh with our interests, while others are good products that would be of interest to at least some of our readers. The product reviewed here fits nicely into the latter category. 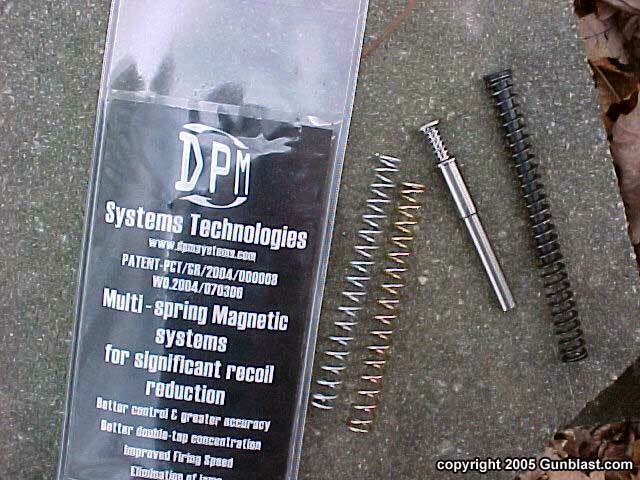 A few weeks ago, I was contacted by Mr. Dimitrios Mantas of DPM Systems Technologies, asking if I might be interested in looking at a new recoil spring system for Glock pistols. The Glock is one of the most popular auto pistols in the world, so I judged this might be of interest to many of our readers. Among other things, Mr. Mantas claimed that his spring system reduced felt recoil, improved reliability, enabled faster repeat shots, aided weapon control, and worked as a slide buffer. This piqued my interest, and being that Mr. Mantas was in the country of Greece, he instructed me to contact his distributor for the western hemisphere, Dead Bang Guns and Automatics, which I did. 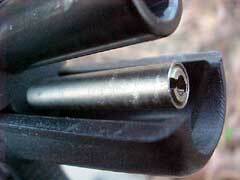 DPM manufactures two systems for the Glock; one mechanical, and another that adds a magnetic dampener to the system. The mechanical system consists of a multi-spring setup on a stainless guide rod, and adds no attachments to the outside of the pistol, and that is the unit that was sent to me for testing. The unit supplied fits the Glock models 19, 23, and 32. That is Glock's midsize frame, and one that is quite popular with shooters. The unit supplied to me came with two different springs to fit outside the guide rod. 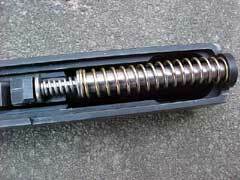 The other springs are captive within the rod. 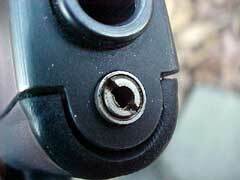 I installed the spring/rod unit into my well-used Glock 19 using what appeared to be the stronger of the two springs. Cycling the slide by hand, one can definitely feel the added resistance near the end of the slide’s rearward travel. One cannot "slam" the slide all the way to the rear with the DPM unit. It is as if there is a buffer between the slide and frame. 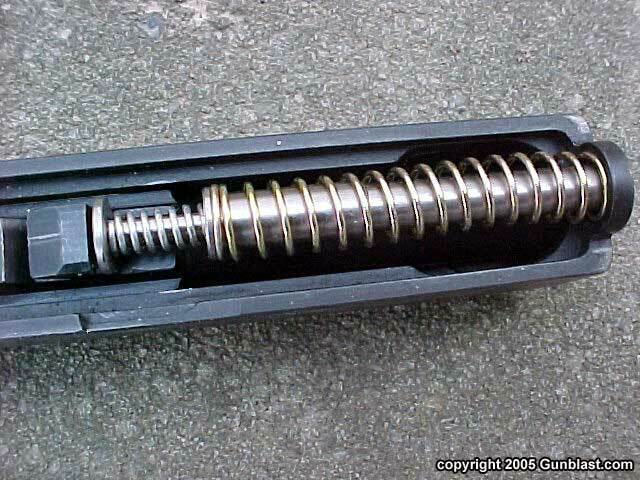 Cycling the slide normally to chamber a cartridge from the magazine is not any harder to do than with the stock spring system. While by no means a scientific test, I proceeded to shoot the Model 19 with a variety of Plus P and Plus P Plus ammunition; mostly Cor-Bon hollowpoints, along with some of their PowRBall ammo. I cannot prove that the DPM system improves reliability, as this Model 19 has never malfunctioned before, but it is still one hundred percent reliable with the DPM recoil system installed. 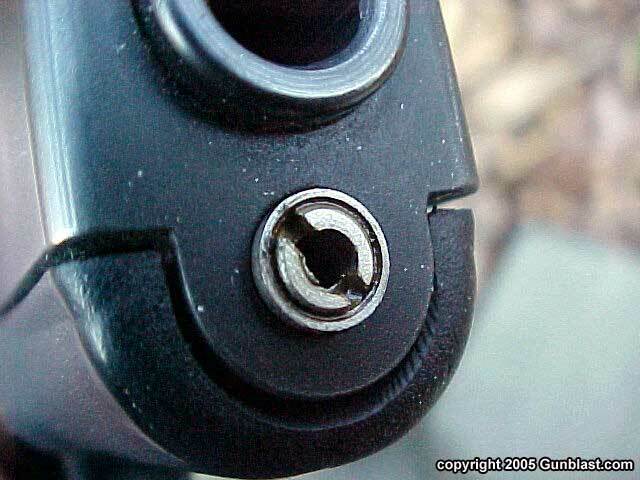 While the 9mm Luger cartridge is not a hard kicker to begin with, I could feel that the slide was not slamming into the frame as it cycled, as it had before with hot ammo. While this is only a subjective view, the gun feels much smoother in operation now than it did before. Quick double-taps are very controllable with the DPM system installed. The Model 19 now feels more controllable, smoother, and seems to operate "slicker’ than it did with the stock system. While my experience with the DPM system is limited to use with this one Model 19, I am so far impressed. Hopefully, I can try their recoil system with other Glock models soon. I would have liked to have tried it with the Model 20 that I recently reviewed, as with some loads it bucked pretty hard. Also, their magneto-mechanical system seems interesting, but it does attach to the accessory rail of a Glock pistol, and would need a holster that is cut to accommodate the unit. I think that the mechanical system tested here should prove useful to all Glock shooters, particularly competitors and law enforcement personnel. It has no bad characteristics, and the benefits of lighter felt recoil, smoother performance, faster repeat shots, and reduced slide battering should appeal to all Glock users. It sells for just 69 bucks, US, and is money well spent. For more information on the DPM system, go to: www.dpmsystems.com. 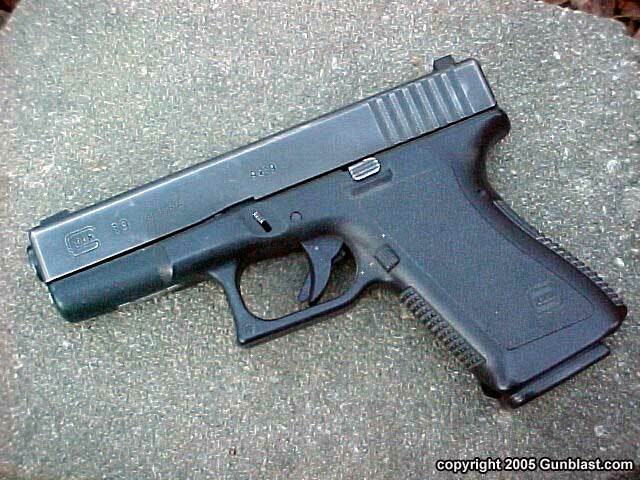 To order the DPM system for your weapon, go to: www.glockuser.com. 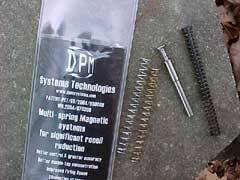 DPM spring kit, with stock Glock spring & guide rod shown at right. DPM spring kit, installed in slide. Author's well-used Glock Model 19. DPM's kit includes a stainless guide rod.